Jacinta Kitt, author of ‘Positive Behaviours, Relationships and Emotions: The Heart of Leadership in a School’, published by NAPD. If you have been fortunate enough to catch one of Jacinta Kitt’s exuberant presentations at a national conference or school staff day, or at one of the hundreds of organisations she has addressed over a long and distinguished career, you will have been energised by a high-voltage, non-stop onslaught of lively language and gripping ideas about how to create and maintain a positive work environment and bring emotional intelligence to bear on the work-place. This book is a distillation of Jacinta’s extensive work over the years as a teacher and facilitator in schools and third level colleges with teachers and leaders – the key personnel in the education system. Each school has a particular and unique atmosphere, either positive or negative, that can be sensed as soon as one walks in. It is invariably linked to those who work in the school and how they treat each other and how well they work together. Each school has a particular and unique atmosphere, either positive or negative. It is impossible for a school to be effective and productive without a prevalence of appropriate interpersonal behaviours and high-quality relationships. School leaders set an example through their own positive behaviour and relationships. 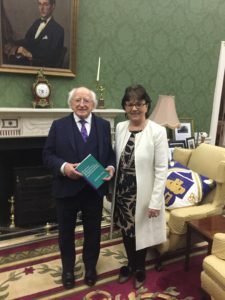 Jacinta Kitt, author of ‘Positive Behaviours, Relationships and Emotions’, presenting her book to President Michael D Higgins. It has been my pleasure to assist with the editing process for this book. Jacinta is sunny and funny, but her bottom line is earnest and serious. This book is about social- and self-awareness, interpersonal skills and emotional intelligence as vital elements in the successful school. Interested in the topic of emotions? 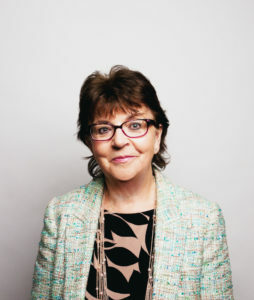 Read this piece “Rediscovering Empathy: Values, Relationships and Practice in a Changing World” with thoughts from Professor Pat Dolan, UNESCO Chair of the Child and Family Research Centre at NUI Galway (2017). And remember to find us on Twitter @EdMatters and use the hashtag #EducationMatters to keep the conversation going. NextHow can I do a better job interview for teaching roles?